The state-of-the-art lobby at Courtyard by Marriott Providence Lincoln, provides greater flexibility and choices for our guests. 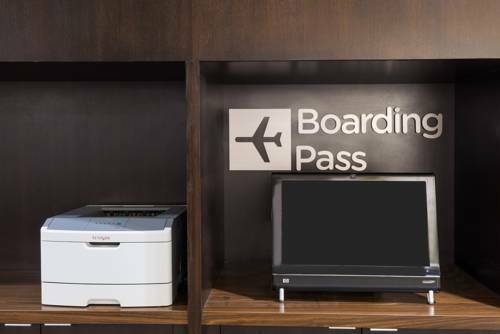 This Rhode Island hotel near Providence features our innovative lobby with inviting, flexible spaces to work or relax in, free Wi-Fi throughout and easy access to the latest news, weather and airport conditions via our GoBoard . The highlight of our lobby experience is The Bistro - Eat. Drink. Connect. which provides guests with healthy food and beverage offerings in the morning and evening dinner service with cocktails. This hotel near Twin River Casino is also conveniently located minutes from Bryant University and Kirkbrae Country Club. We offer complimentary shuttle service within 5 miles, a well equipped fitness center, indoor pool and whirlpool. A 24-hour business center and boarding pass printing service is also available. Your stay at Courtyard by Marriott Providence Lincoln is sure to be more comfortable and more productive than ever before! The Bistro - Eat. Drink. Connect. : Your food and beverage destination for refreshing breakfast choices in the morning, and a variety of dinner and cocktail options in the evening. The Bistro also offers specialty beverages made with Starbucks coffee to help you get a jump on the day.